Over the years, I’d only truly fallen in love–to the point where I’d begged Mike to bend the rules–a handful of times. They were usually Pit Bulls with sad stories and beautiful faces who I’d convinced myself needed me. But two of the dogs I fell for were Boxers, a breed I knew little about when I first encountered Capone. 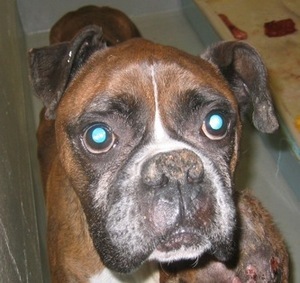 He’d arrived at San Francisco Animal Care and Control, a victim of severe neglect. I’d be lying if I said the softball-sized tumor on his shoulder was not the first thing you noticed about him. But the second thing was his tender bravery, despite having every reason to lash out–or withdraw. Capone had been kept outside, alone, in a tiny area which was covered in feces by the time he was rescued by Animal Control. 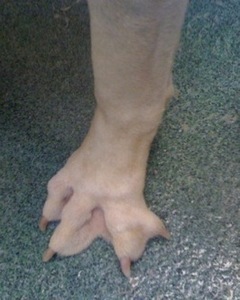 He’d been given food and water, but the dog was emaciated. Every ounce of nourishment had gone to sustain the enormous growth he carried around with him. Mike agreed that this was one we should bring home. Even with superlative medical care from the Pets Unlimited Animal Hospital, Capone didn’t survive the surgery to remove the tumor. It was my first real canine heartbreak, and I took it hard. The only comfort was knowing his last weeks at the shelter were filled with unceasing affection and attention from volunteers and staff. Small consolation, yes. 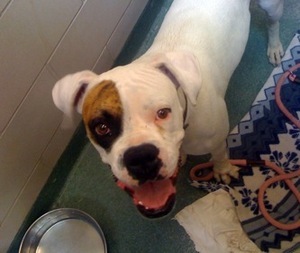 My second Boxer love, Roxy, arrived at the Santa Fe shelter last week. Like Capone, there’s an air of regal vulnerability about her–and a deformity, albeit just slight–that makes her all the more endearing. I wish we were currently in a position to adopt her, but I know she’ll fare just fine with another family. Instead, I give her extra pets and spend long stretches in her kennel. She’s lovely. Unique markings and an unusually gentle disposition. But I know the real reason for our connection is that she reminds me of my beloved Capone. The dog I still desperately wish I could save.